Happy Valentine’s Day! Here’s the Estee Lauder spring gift with purchase – 7 free samples with any $37.50 purchase from Boscov’s. 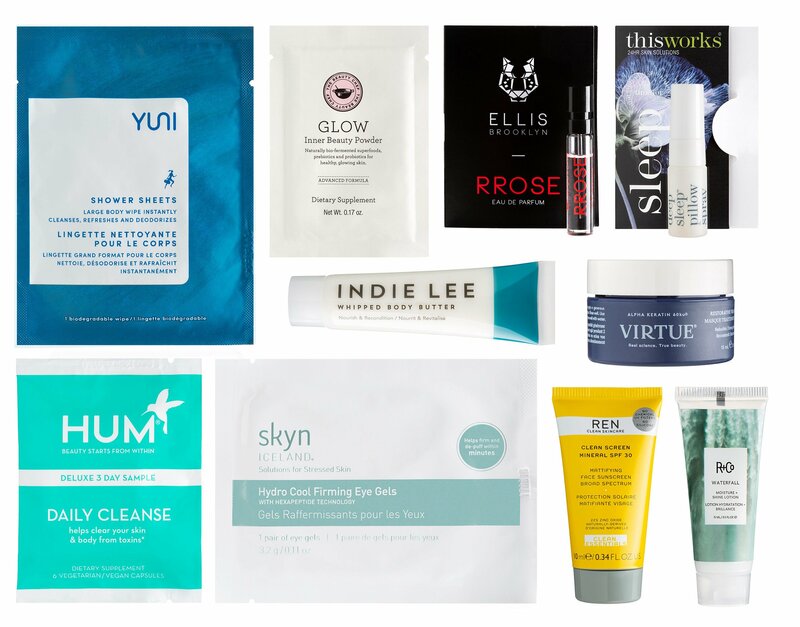 Plus, ten new Valentine’s Day beauty deals like free 3.5ml La Mer samples at Sephora, free YSL kits with any YSL purchase at Barneys, free Natura Bisse sample with $50 purchase at Bluemercury and more! Boscov’s (NEW) GIFT 1: Customize your free 7-piece Estee Lauder gift with any Estee Lauder purchase of $37.50 or more. This post may contain affiliate links. Read the full disclosure. Knock knock, there are new Ulta Beauty Break and Estee Lauder & Elizabeth Arden GWP at Nordstorm and Stage Stores! Plus, beautiful 50% off Jo Loves at Sephora! Ulta (NEW) Beauty Break! FREE 5 Pc Benefit Cosmetics Gift with any $60 online purchase. This post may contain affiliate links. Read the full disclosure. Lancome fans, the fall Lancome gift with purchase 7pc with $37.50 are available now at Boscov’s and The Bay Canada. Skinstore runs nice stacking beauty deals: 10Pc mystery gift and BOGO 50% off! Also, nice Lipstick kits from Birchbox, new QVC beauty box and more in mini gift with purchase updates! Boscov’s (NEW) Receive a FREE 7-Piece Gift with any $37.50 Lancome purchase. This post may contain affiliate links. Read the full disclosure. It’s Clinique Bonus Time and step-up gifts at Boscov’s and The Bay Canada September 2018 only. Plus, upcoming Sephora Favorites Superstars Kit, Skinstore x Caudalie beauty box and Estée Lauder Bronze Goddess Illuminating Powder Gelée! Boscov’s (NEW) GIFT 1: Choose a FREE 7 piece gift with any $29 Clinique purchase. This post may contain affiliate links. Read the full disclosure. Estee Lauder 7-piece summer gift with purchase are available now for May 2018 at Boscov’s and Hudson’s Bay! Plus, there’s a fantastic stacking beauty bundle and GWP at TOO FACED! Boscov’s (NEW) Receive your 7pc Estee Lauder Summer Getaway Gift FREE with any Estee lauder purchase of $45 or more. CHOOSE YOUR GIFT from Bronze Goddess or Summer Nights. This post may contain affiliate links. Read the full disclosure. Clinique bonus time March 2018 has begun at Boscov’s and Dillards. Customize free Clinique gift with any $28 purchase + super step up gifts. New deluxe daisy coupon at Sephora and two new beauty break gifts at Ulta. Boscov’s at Clinique shop and Dillard’s – For a limited time, receive a free gift with any $28 Clinique purchase! This post may contain affiliate links. Read the full disclosure. Happy Valentine’s Day! Here’s the latest Valentine’s Day Beauty deals today: new 7-piece Estee Lauder gift $37.50 with purchase at Boscov’s (up to $145 value), Amazon Surprise Sweets box, Latest in Beauty Date Night box for 14 pound, The Bay Canada 6-piece Lancome gift with 2 items purchase and Ulta $75 value beauty break! Boscov’s (NEW) Receive a FREE 7-piece gift with any $37.50 Estee Lauder purchase! Both Gifts Together Worth Up To $225 * This post may contain affiliate links. Read the full disclosure. Bon Ton is closing over 40 stores. I have new beauty gift with purchase from Boscov’s, Bon Ton, Stage Stores deparment stores to share. Plus, there are really good beauty bonus offers at Walgreens, Smashbox, Clarins you must see. Boscov’s (NEW) Choose your free cosmetic bag on any $35 beauty purchase. (NEW) Choose a free pair of his and her wine or beer glasses on any $65 beauty purchase. If you are wondering about THE MEGA gift bags coming in February, and the next Clinique, Estee Lauder and Lancome gift with purchase offers from Macy’s, Boscov’s, Belk, Bloomingdale’s, Macy’s, Dillard’s and Bon Ton, please see more detail in my top page here (contains spoilers). This post may contain affiliate links. Read the full disclosure.